Discover significant sales insights instantly using advanced filters. 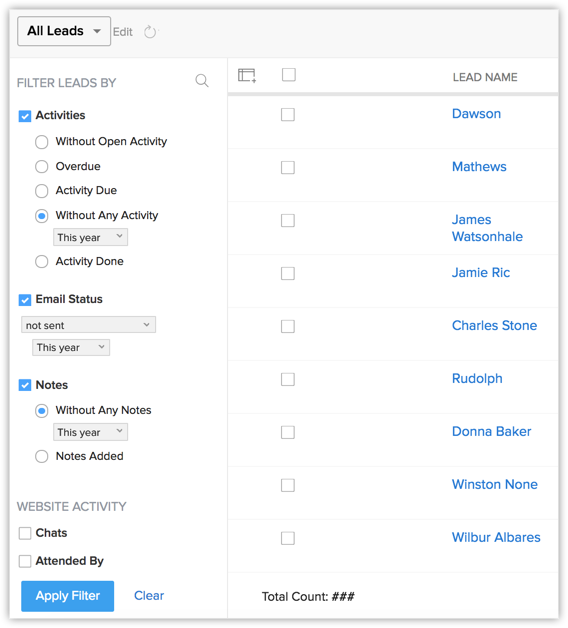 The Advanced filters in Zoho CRM are a great avenue for you to dig deep into your CRM to discover important sales insights in no time. Over the last six months, your CRM has accumulated a great number of leads. You have followed up with most of them but there could be a big deal hidden somewhere amidst the leads that did not respond the first time around. If only you could pull up such idle leads quickly and follow-up again. You have a handful of deals that are waiting to be closed by the end of the month. But you suspect that several tasks associated with the deals are still pending. If only you could pull up such deals on a single click. You offer a live chat service to your customers from your website. If only there was a way to quickly pull up the list of important customers whose chat requests you missed in the last week. Using an intelligent combination of these criteria, you can easily pull out the relevant records as discussed in the scenarios above. Search for leads "Without any activity in this year", for which emails have "not been sent this year" and "without any notes" this year. This could mean that the leads have been idle for a long time. Search for deals "Closing this month" with "Overdue" activities. Search for "Chats missed this week". Now once you have filtered these records, you can apply actions on them such as assigning them to your sales reps, mass update, run macro and so on. 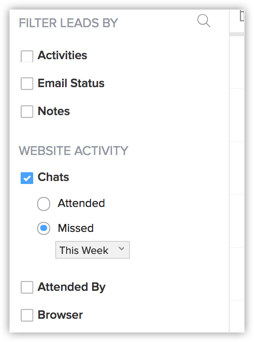 This way you can instantly assign idle leads to sales reps, remind your teams to follow up on overdue tasks and missed chats. Advanced filters thus let you discover great CRM insights and also help you act on them immediately.